Why choose Metal Craft Boat Lifts? 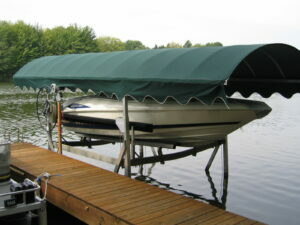 Bunks and guides are available in standard, deluxe and pontoon options. Aircraft grade stainless steel cable and Nylatron GSM pulleys on stainless steel axels ensuring no rust or seizure. 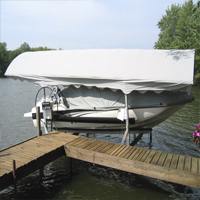 Metal Craft Boat and PWC Lifts are made of marine grade aluminum structural components with stainless steel cables and fasteners (underwater). Stainless steel cables are pre-strung at the factory for easier installation. Metal Craft Vertical Boat hoists will hold watercraft weighing up to 5,000 lbs. 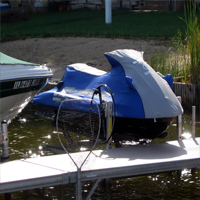 Vertical Boat Lifts are available in four models to accommodate various watercraft lengths and beam widths. Optional accessories include deluxe and pontoon bunks/guides, electric winches and canopies. Metal Craft PWC Lifts will hold watercraft up to 1200 lbs. Our cantilever lift design is available in two models and features adjustable, 6’long marine grade carpeted bunks preventing damaged to the underside of water craft.